*A woman protesting during today’s confirmation vote of Sen. Jeff Sessions for Attorney General gave the guards escorting her out an earful. Multiple protests took place during Sessions’ two-day confirmation hearing earlier this month over his far-right voting record and allegations of racism. And the protests continued on with today’s vote, less than 24 hours after President Trump fired acting Attorney General Sally Yates for refusing to enforce his travel ban. 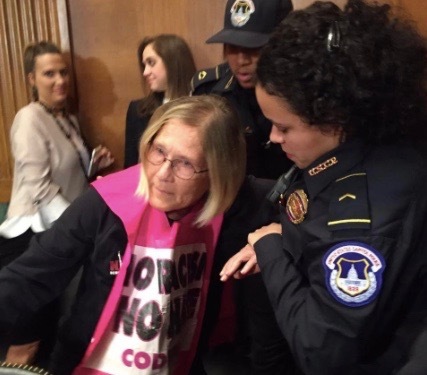 During the vote in the Senate Judiciary Committee, a Code Pink protester named Ann Wright stood up. “I say no to Jeff Sessions, no to hatred, no to racism, no to the ban on refugees,” she announced before being grabbed by a guard and moved forcibly toward the exit. Wright is a co-author of the book “Dissent: Voices of Conscience,” which chronicles her activism since resigning from her State Department post prior to the Iraq War.